← News Diet, What News Diet?! Most of you might have recently been hearing news about Lance Armstrong and how he has confessed to cheating in this past month on Oprah. I found a very interesting article on The Guardian written about Armstrong being sued on January of 2013. As I am sure some of you are also interested in this topic I wanted to talk to you about how useful The Guardian was at helping me understand and gather more information about this intriguing topic. To tell this story to its readers The Guardian used text, photos, and video to inform the readers of this story. I had some troubles with the website at first, because the videos where not linked inside the article. 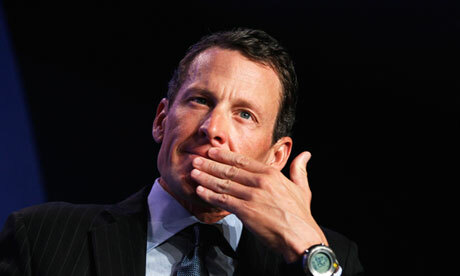 You had to click on Lance Armstrong’s name then find the Oprah videos and watch them. With this being said I was not impressed with the presentation of the Guardian’s article. I did however; find the story to be very interesting to me regardless of the misleading links on the site. Hearing about how a man’s life is falling to pieces right before our eyes and yet he still has the will to fight and get back into a sport he loves. Talk about heart and drive from one man right there. The biggest strength I think this story has is a video on Oprah when Lance breaks down into tears when he has to tell his son to stop defending him because he really did cheat (Click for video link) . I felt like the linking of the stories were very useful and made you see another side of Armstrong that you can’t just read about to understand, but one must see to understand. The story did have some weaknesses in it. I personally didn’t like the picture they picked for the article. I feel like it didn’t show the right emotion they were trying to give in the story and that was in a way contradicting, but this article left me wanting to know more. Surprisingly from this article I learned that Lance Armstrong cheated to win his many Tour de France titles but this man will not stop trying to compete in a sport he loves. However, I may not agree that he should ever be allowed to race again, but he will not give up. To improve this story I would have the links better distinguished for the readers to follow. Also, I would have them in order of the Oprah interview not just pick a video you want to watch. This makes it confusing for the readers to follow when the clips are out of order.